Poly-Tech Sleep and W8MD’ s Philadelphia medical weight loss center is a physician supervised medical weight loss, sleep disorder management and wellness clinic aimed at addressing the true causes of weight gain including the complex metabolic, nutritional, hormonal, stress, and sleep related factors under the careful supervision of a physician trained in the new field of obesity medicine or medical weight loss. 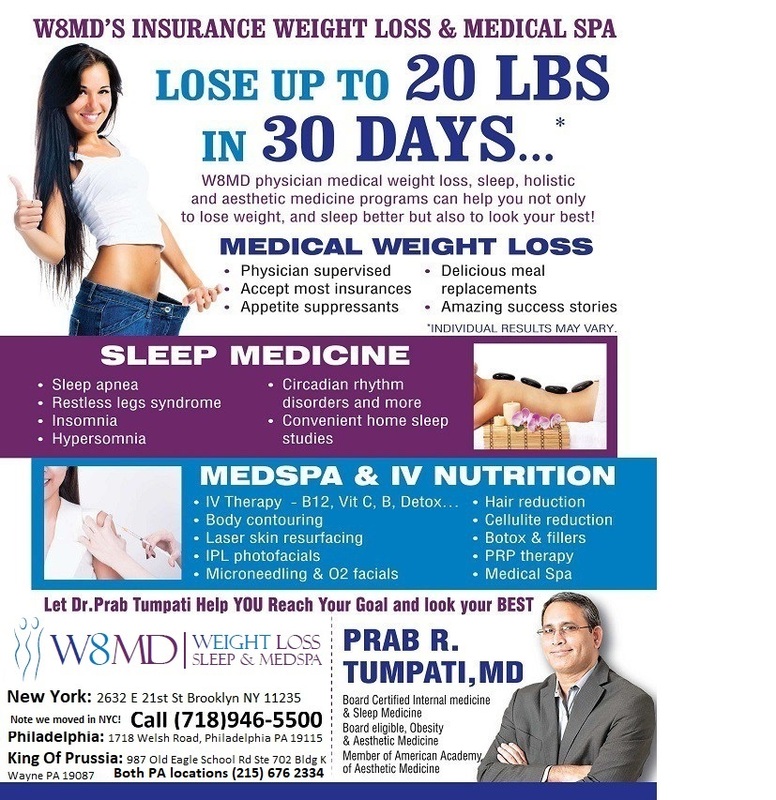 Our medical director, and weight loss doctor, Dr. Prab R. Tumpati is one of the founders of W8MD medical weight loss centers of America and has passed a written board examination in the field Of obesity medicine in addition to being board certified in sleep Medicine and internal medicine. Our state of the art, American Academy of Sleep Medicine Accredited Sleep Lab in Philadelphia provides full range of sleep disorder management services including sleep apnea, insomnia, narcolepsy, rest less leg syndrome management etc. Dr. Tumpati is also a board certified internal medicine, and sleep medicine physician with over 300 CME credits in the new field of Obesity Medicine(formerly called bariatric medicine), having passed a written board certification examination in this field. Our physician weight loss clinic in greater Philadelphia is designed to help prevent over 50 obesity related conditions including diabetes, heart disease, cholesterol abnormalities and even cancers as obesity is a risk factor for many chronic medical problems. Why should you lose weight in Philadelphia? According to current research, even a small amount of weight loss can lead to big health benefits including reduced health risk for over 50 different medical problems such as reduced risk of cardiovascular disease, stroke, sleep apnea, depression, anxiety, joint problems, even reduced risk of many types of cancers as obesity is a risk factor for many gastrointestinal and genitourinary cancers! Where to start before losing weight in greater Philadelphia? Check your Body Mass Index (link is external) (BMI) – an indicator of body fat – and see where it fits within the BMI categories. Remember that even a small amount of weight loss can lead to big health benefits. Estimate your calorie needs. Determine the number of calories needed each day to maintain your current weight. To lose about 1 pound per week, subtract 500-1000 calories each day from the daily amount. To lose about 1 pound per week, substract about 500 calories per week, and to lose 2 pounds per week, subtract 1000 calories daily. Score your current food intake and physical activity level. Taking a good look at your current habits will help you determine what changes you might make as well as what you are doing right. If an appetite suppressant medication is prescribed, take your weight loss medication as prescribed. How Do I Know Which Weight Loss Doctor in Greater Philadelphia is Right For Me? Keep in mind that you want to develop lifestyle habits that will help you maintain your weight in a healthy range. A short-term “diet” that you “go on” and then “go off” is not the answer to long-term weight management. In choosing how to go about losing weight, keep in mind key habits of people who have lost weight and kept in off. These people are called “Successful Losers” by the weight control experts who have studied them. Why should you use our W8MD’s insurance physician weight loss program in Philadelphia? Our weight loss program in Philadelphia is unique in many ways! We address both weight loss and sleep disorders as they go together. We provide delicious and affordable meal replacement supplements and VLCD and LCD diet plans for quick weight loss in Philly. Also have weight loss centers in New Jersey, New York City, more to come. Our North East Philadelphia Weight Loss and Sleep Center is located at the following address. Specialties: Weight Loss Doctor Philly, Philadelphia Weight Loss, Sleep Clinic, Sleep Study Clinic, Sleep Apnea Clinics, Medical Weight Loss, Weight Loss Pills, Weight Loss Supplements, Fast Weight Loss Options, King of Prussia weight loss diet, weight loss program Philadelphia. Cities Served for insurance physician weight loss: North East Philadelphia, Bensalem, Horhsam, Abington, Norristown, Pottstown, West Chester, King of Prussia, Huntington Valley, Southampton, Cheltenham, Bristol, Yardley, West Chester, Exton, Pottstown, Lansdale, Warminster, Warrington, Abington, Jenkintown, Levittown, Lang Horne etc. Payments accepted: Accept Health Insurance for the weight loss physician visits. Accept American Express, Mastercard, Visa, Discover, Check, Cash for weight loss supplements. fatty liver, belly fat reduction, diabetes etc. to name a few. W8MD medical weight loss program at Vida Sleep Center of Dr. Felix Roque’s office at 543, 45th Street, Union City, New Jersey. 543 45th St, Union City, NJ 07087. Phone (201) 766-6469. Since this is a unique program that addresses the true causes of weight gain, and not an average weight loss clinic, we do get patients from far and near including from other states! Call 1-800-985-3007 (1800-W8MD-007) to learn more. Dr. Tumpati is an excellent physician: tentative, caring and an expert in his field. Laura and his staff are very helpful, supportive and knowledgeable. If you’ve been thinking about finally taking off the weight give them a call. After a thorough evaluation and history and physical Dr. Tumpati tailors a plan specific to you. That’s what makes the difference. I’ve tried other ways even other weight loss centers, supplements you name them. Never have I reached my goal. Until now! Feeling great, energetic and young again. – Mac Chelle K. on Yelp.